All text and file transmission messages are logged on both client and server side, which makes things traceable. And, messages delivery via BigAnt is firmly assured - you even be notified when your contact is back to his seat and read your message. IT engineers in your company would love to use this feature, as they can help you out in case there are something wrong with your computer system, and it also gives you the opportunity of fully accessing your computer when you are out of office. BigAnt is a born on-premises program, this allows you to build high availability independent LAN/WAN messenger, and this gives you full control over your data. BigAnt server also provides SAAS entry, this is a total solution for both front and back ends. BigAnt makes it easy to add bulk contacts in the BigAnt user list, simply import users from your existing active directory or LDAP, or import users from a pre-saved address book. In BigAnt client main panel, all contacts are clearly listed as your organization chart, finding a contact is easier than ever. All BigAnt messages travel over network are encrypted using AES256, which meets military standard. And the user account and log-in system meets HIPPA spirit. It is secure to access BigAnt when you are connecting to WiFi in airport, hotel or cafe house. Your admin can assign a Team for workshop, and yourself as a member can Group your people for task forces, or simply Discuss with them. Find your Team/Group/Discussion in BigAnt and have fun in your work. 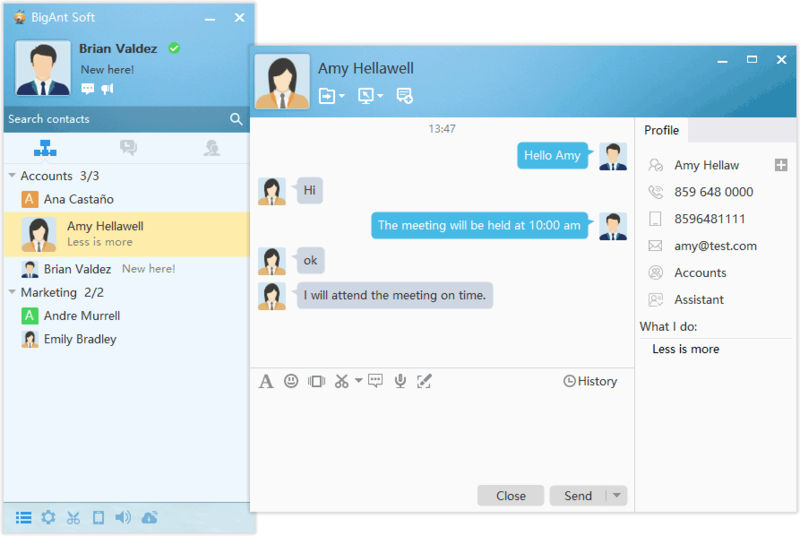 During the last decade, thousands of satisfied users in more than 25 countries use BigAnt messenger for internal communication needs. "Bigant is amazing, it brought to my company the confidence to communicate with the peace of mind, knowing that all communication is going through a server that is seating on our office and encrypted it is amazingly confortable. We make any change as we like and at any time and place. Bigant support team are great, I think they don't sleep, I just love them, they are always ready to give us a hand whenever we need and at no time, thanks and please keep up the great work.